New York, Perls Galleries, Alexander Calder: Crags and Critters of 1974, October-November 1974, p. 1 (illustrated in color) and p. 15, no 2 (illustrated). This work is registered in the archives of the Calder Foundation, New York, under application number A02533. rag with White Flower and Discs reveals the early influence of surrealism and neo-plasticity on the artist while simultaneously celebrating a love of primary color and child-like automatism shared by his close friend and contemporary Jean Miro. rag with White Flower and Discs, was originally shown in the 1974 exhibit "Crags and Critters" at Perls Gallery in New York . Each of the 15 works Calder made for "Crags and Critters" was either a smiling, slightly menacing three-legged "critter", or a cartoon-like mountain crag with multiple attached mobile-esque moving elements as visible in the present lot. Illustrated on the frontispiece of the exhibition catalogue, the 15 works are grouped, gang-like on the gallery floor. 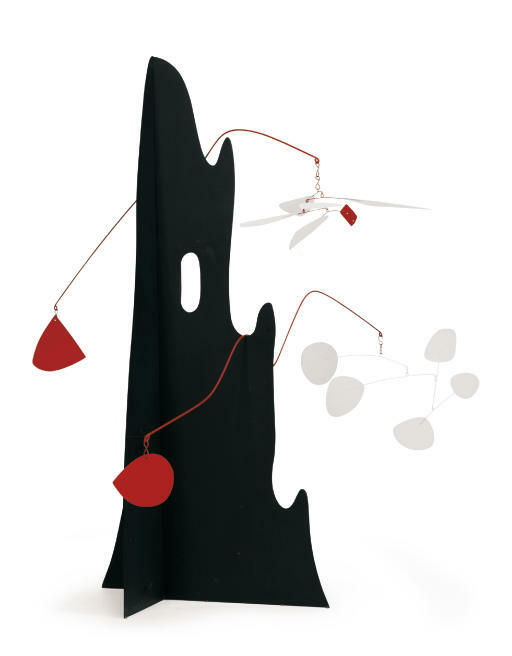 This arrangement, like the works themselves, is an extension of Calder's personality, creating a constellation of imagery for the viewer to experience. Neither from the land nor the sea, the critters can hail only from outer space, while the crags that accompany them, sprouting surreal flowers and leaves, make up their Martian landscape. Even at the late age of Seventy-six Alexander Calder's child-like interest in whimsy and delight remain visible through this particularly wonderful example of the artist's late work. Calder's works of the 1970's often engage, however playfully, with paraphrased ideas regarding the future and science fiction. Obus, of 1972, is a space-ship themed stabile welded into the rough shape of a rocket launcher, with fire-engine red flames spurting from its side. Similarly, in Crag with White Flower and Disc, the peaks and craters of a mountain are reduced to simple, cut out planar forms. Balancing steadily from its sides, the imaginary space vegetation is a naove and humorous evocation of the surreal.